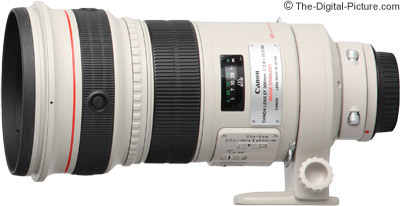 Note: The Canon EF 300mm f/2.8L IS USM Lens has been replaced by the Canon EF 300mm f/2.8L IS II USM Lens. Note that the excellent Canon EF 300mm f/2.8L IS USM Lens has been replaced by the even more incredible Canon EF 300mm f/2.8L II IS USM Lens. The Canon EF 300mm f/2.8L IS USM Lens produces absolutely awesome image quality. This may be the highest image quality Canon EF lens made. Review update: The newer Canon EF 200mm f/2.0L IS USM Lens is at least as good. Up the new "II" super telephoto versions have raised the bar again. 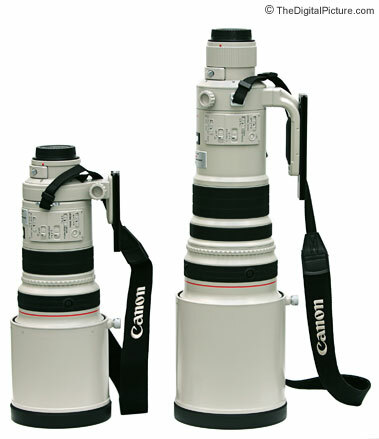 Canon introduced the 300 f/2.8 IS lens in 1999 along with a number of other Super Telephoto lenses including the Canon EF 400mm f/2.8L IS USM Lens and the Canon EF 500mm f/4L IS USM Lens. All of these lenses have proven to be incredible performers. The Canon EF 300mm f/2.8L IS USM Lens is probably most-noted for being extremely sharp. Results at f/2.8 are very sharp from the center right into the full frame corners and only a very slight improvement is noticed when stopped down. This lens is very usable at f/2.8 (I primarily use this lens at f/2.8) - if the super-thin DOF (Depth of Field) is adequate of course. As illustrated in the above picture, thin DOF (at f/2.8) combined with 300mm telephoto compression can produce a beautiful OOF (Out of Focus) background - easily separating your subject from an otherwise distracting background. Bokeh (background/foreground blur quality) is very good - an 8-blade aperture helps in this regard. All other image quality aspects of this lens are excellent as well - color and contrast are superb. A fluorite element and two UD-glass elements are very successfully utilized to correct CA (Chromatic Aberration). Light fall-off is minor and rather even at f/2.8 on a full frame body. Distortion is negligible, flare is well controlled. 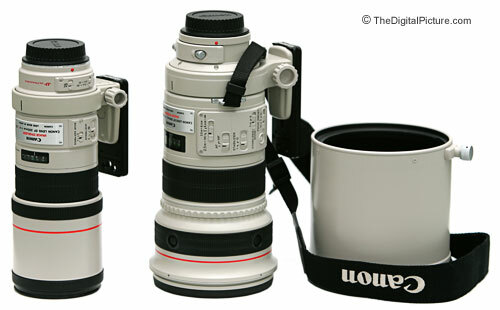 Super fast and very accurate focusing are trademarks of the Canon EF 300mm f/2.8L IS USM Lens. This lens is made to keep up with the fastest subjects - Canon has utilized this lens to test camera body focus performance. The AI Servo performance of the 300 f/2.8 IS is among the best of any lens I've used - the in-focus hit rate is very high when I do my job right. An internal focusing Ring USM (Ultrasonic Motor) is employed and FTM (Full Time manual focus) is enabled. A 3-position focus limiter switch allows focusing distances to be limited to a specific distance range - or to be unlimited (2.5m to 6.4m, 6.4m to infinity, 2.5m to infinity). 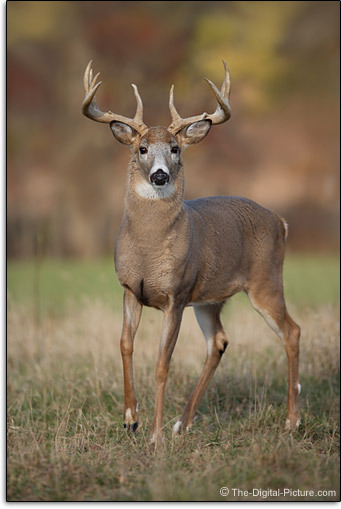 Limiting the focus distance range can improve focus lock times. Autofocus stop buttons near the objective lens allow autofocus to be temporarily suspended. The 300 f/2.8 IS also includes a Focus Preset feature. Set the Focus Preset to a specific distance - when your shooting needs require that specific distance, simply turn the white knurled playback ring on the end of the lens. Pictured above from left to right are the Canon EF 400mm f/4L DO IS USM Lens, Canon EF 300mm f/2.8L IS USM Lens and Canon EF 500mm f/4 IS L USM Lens with optional Wimberley Lens Plates attached. While not small or light, the 300 f/2.8 IS is one of the smaller Canon Super Telephoto lenses - significantly smaller and lighter than many of them. Weight-saving magnesium-alloy is is utilized in the lens body resulting in a 5.6 lb (2,550g) lens-only scale reading. The 300 f/2.8 IS measures 5.0" x 9.9" (128.0mm x 252.0mm) without the included Canon ET-120 carbon fiber (high strength/light weight) lens hood attached. If you are used to using Canon's consumer zooms, this lens is going to be a handful until you get used to it (the image quality will help you get used to it real fast). If you are frequently using the 400 f/2.8L IS, this lens is going to feel small and light. The weight makes handholding the 300 f/2.8 IS tiring after long periods of time - but it is definitely handholdable for the average person. IS (Image Stabilization) makes getting sharp images while handholding the 300 f/2.8 IS significantly easier for subjects that are not moving rapidly - or are able to be shot in the available IS Mode 2 (Panning Mode). IS allows handholding this 300 at shutter speeds of 1/125 or lower (about 2 stops of benefit). I am a huge fan of Canon's IS lenses - they definitely let me get shots I would otherwise miss. The IS version on this lens is tripod-sensing. The 300 f/2.8 IS knows that a tripod is being used when vibrations go below a certain level. Keep IS turned on when mounting this lens on a tripod to take advantage of the secondary IS mode - reducing mirror slap, shutter and tripod vibrations. When mounting a camera body and the 300 f/2.8 IS on a tripod, a strong tripod head and tripod legs are required. Even better is to mount the body and lens on a Wimberley Sidekick or a full Wimberley Head. The risk for the lens being damaging by flopping over is significantly reduced with the gimbal-type mounts. For sports and similar photography situations, a monopod makes the 300 f/2.8 greatly easier to handle for long periods of time. The 300 IS has a removable rotating tripod collar to which I attached a Wimberley P30 Lens Plate for tripod use. The 300 f/2.8 IS performs better with the Canon EF 1.4x II Extender and the Canon EF 2x II Extender than most if not all other Canon lenses. Adding the 1.4x creates a 420mm f/4.0 IS lens - a very nice focal length and max aperture - and yes, IS still functions with the extenders installed. The 1.4x adds CA, some barrel distortion and some full-frame body corner softness. Adding the 2x creates a still healthy 600mm f/5.6 IS lens that autofocuses on all Canon EOS bodies. Results with the 2x show some degradation - especially in contrast, but the combination is very usable - especially when stopped down a stop or so. Extenders reduce the AF speed somewhat. The Canon EF 300mm f/4L IS USM Lens differs from the Canon EF 300mm f/2.8L IS USM Lens in title by only one f-stop, but there are more differences. The f/2.8 is sharper at f/2.8 than the f/4 is at f/4 and remains sharper at all comparable apertures. The f/2.8 costs significantly more and is significantly larger/heavier than the f/4. With its built-in lens hood, the f/4 can be quickly put into action while the f/2.8 must be assembled (if you want to use the hood). The f/4 version focuses down to about 5' (1.5m) for a .24x maximum magnification while the f/2.8's minimum focus distance is a relatively long 8.2' (2.5m) for a maximum magnification of .13x. An extension tube can resolve this issue, but more assembly is required and infinity focus is lost. Maximum magnification is extended to .18x and .25x with 12mm and 25mm extension tubes respectively. The Canon EF 300 f/4 IS L Lens (above left) is significantly smaller than the Canon EF 300 f/2.8 IS L Lens (above right). Both lenses have optional Wimberley Lens Plates attached to their included tripod collars. The relatively large Canon EF 300 f/2.8 IS L Lens (above left) is noticeably smaller than the Canon EF 500 f/4 IS L Lens (above right). Both lenses have Wimberley Lens Plates attached to their tripod collars and lens hoods in place. 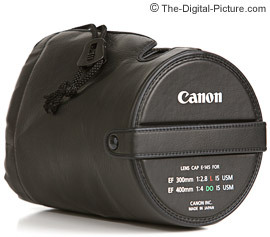 When purchased from a reputable dealer, the Canon EF 300mm f/2.8L IS USM Lens arrives packed in a very-expensive-to-purchase-separately Canon Lens Case 300 hard lens trunk/case. As the trunk is not sized to accommodate a camera body in addition to the lens, I generally carry my 300 in a Lightware z300 Long Lens Case when I need a body mounted. The lens (with no body attached) will also fit in the Lowepro Toploader 75 AW. 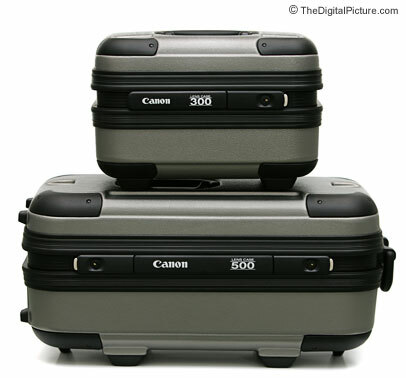 The Canon EF 300 f/2.8 IS L Lens case (above top) measures about 14.5"W x 9.5"H x 10"D and is noticeably smaller than the Canon EF 500 f/4 IS L Lens case (above bottom). An included leather-like lens cover protects the large objective end of the lens. This cover provides an objective-lens-protecting rigid cap inside a lens-hood-covering pouch-shaped cover. It is a bit of a pain to use, but functional. The 300 f/2.8 IS accepts 52mm rear drop-in filters in the included holder. The filter holder has clear glass in it - which helps prevent dust from getting into the rear lens element deep in the lens body. No provision is made for front-mounted filters - which would cost a fortune if available. A Canon neck strap is included (and illustrated in the picture above). With build quality typical of a Canon L Series Lens, the Canon EF 300mm f/2.8L IS USM Lens is designed to withstand the rigors of professional use. The 300 f/2.8 is weather-sealed when used with a similarly-sealed Canon body. The protective objective element can be replaced relatively inexpensively should something unfortunate happen. I most frequently use my Canon EF 300mm f/2.8L IS USM Lens to capture sports action. The long focal length and fast aperture make it ideal to stop distant action and blur the busy, distracting background. Motorsports, baseball, football, tennis, swimming/diving ... Watch the sidelines at these events to see what the pros are using - you will frequently see the 300 f/2.8 IS well represented. Many wildlife applications are suitable for the 300 f/2.8 IS. 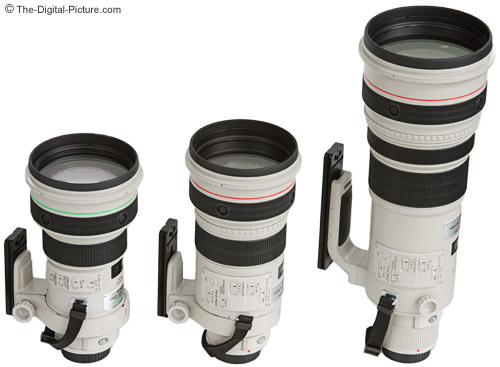 Medium and large game in poor light calls for this lens or its big brother - the Canon EF 400mm f/2.8L IS USM Lens. Although performance is decent even with the Canon EF Extender 2x, I recommend bird photographers purchase the Canon EF 500mm f/4L IS USM Lens or Canon EF 600mm f/4L IS USM Lens. The extra length and the ability to add extenders from there make these lenses better-suited for this task. I haven't heard any serious bird photographers complaining about having too much focal length. If these lenses are not in your budget, or you need the smaller size/weight of the 300 f/2.8, this lens can get the job done very well. Landscape photography can often utilize a 300mm lens - none resolve the details better than the 300 f/2.8 IS - which is exactly what landscape photographers are looking for though most will not like the weight factor. The 300 f/2.8 IS is commonly employed for portrait photography - especially on 1.0x and 1.3x FOVCF bodies. The telephoto compression and excellent bokeh (background blur quality) combine for beautiful people pictures. Obviously, each lens has a niche in the marketplace. But if the Canon EF 300mm f/2.8L IS USM Lens can fill your need, Canon lens performance doesn't get any better than this.